The Harley Davidson Street 750 has so far enjoyed a free run of sorts in the Indian motorcycle market. Targeted at those looking for a sub-5 lakh cruiser, the entry-level HD model ticks almost all the boxes. Hence, it has become the obvious choice of many. However, it looks like Royal Enfield, which enjoys a cult status of sorts, is about to gatecrash into the American motorcycle maker’s party. The iconic Indian motorcycle maker has unveiled its 650cc parallel twin engine at EICMA 2017. Soon, the company will come up with not one but two new motorcycles that will boast this new motor. Both these models will launch in India, and guess what, they should have the Street 750 in crosshairs. You can find how these two motorcycles stack up against each other in our Royal Enfield 650 vs Harley Davidson Street 750 comparison here. 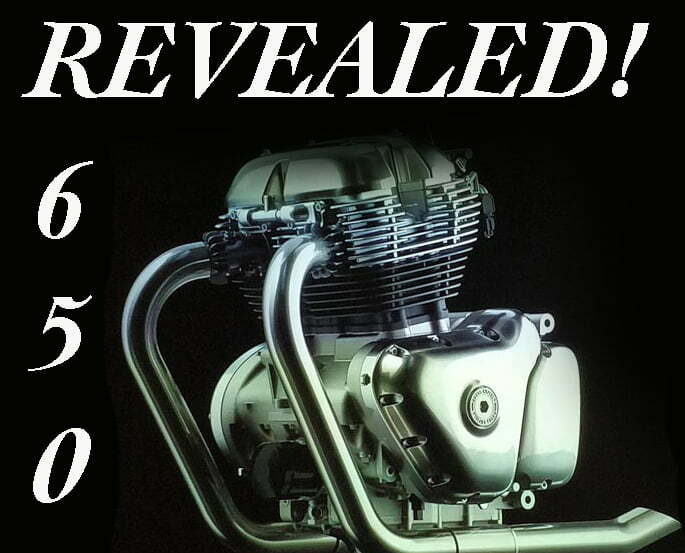 The new 650cc parallel twin will power two REs – Continental GT 650 and Interceptor 650. Both these motorcycles will be sold at really competitive price points. There are really very good chances that prices of these bikes will start at roughly Rs 3 lakh. Local manufacturing, along with parts sharing with smaller Royal Enfield models, should help the manufacturer price both its new models very competitively. In comparison, which is the Street 750 is the cheapest Harley Davidson you can buy in India, costs Rs 4.91 lakh. Hence, both the new Royal Enfield 650 cc motorcycles will enjoy a huge cost advantage over their American rival. Both the new Royal Enfield 650 Conti GT and Interceptor models will be the most powerful REs ever. The new 650cc parallel twin motor’s external appearance pays homage to a twin-cylinder Royal Enfield engine of 1948. On the inside, however, the engine has new-age internals. It boasts a SOHC head and outputs a maximum power of 47 PS power at 7,000 rpm and produces a peak torque of 52 Nm torque at 4,000 rpm. While the power figure is definitely nothing to write home about, the high torque will help this motor offer a grunty performance. On the other hand, the HD Street 750 has a 749.9cc heart that belts out a maximum power of 52 PS at 8,000 RPM and a peak torque of 59 Nm at 4,000 RPM. If you look closely, the HD doesn’t enjoy a huge advantage over the Royal Enfield. Also, compared to a 200 KGs kerb weight of the new Royal Enfield models, the Street 750 tips the scale at over 222 KGs. Hence, there won’t be a great difference in the on-road performance of the two motorcycles. 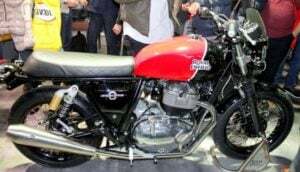 The new Royal Enfield 650 cc engine will be seen powering two models – a Continental GT 650 cafe racer and a Bonneville-like retro motorcycle called the Interceptor 650. Both the motorcycles get upswept twin exhausts and loads of retro feel. While the cafe racer looks much like the Conti GT 535, the new Interceptor gets a rounder fuel tank and a flat seat that can accommodate two. The Conti GT continues with a single-seat arrangement. Both the motorcycles look very classy and should appeal to those looking for a classic design with modern mechanicals. In comparison, the Harley Davidson Street 750 offers true-blue American looks with high-set handlebars, stepped seat, multi-spoke alloy wheels and the optional Screamin’ Eagle silencer. Compared to the new REs, Street 750 offers cruiser motorcycle looks of its larger siblings. It’s really tough to pick one out of these three as it all boils down to personal taste. Our pick, if you ask, has to be the new Royal Enfield Continental GT 650 for its racy style, retro appeal and that upswept twin exhaust treatment. Price- One thing is for sure, the new REs will cost significantly lesser. In price wars alone, the Street 750 will have a tough time competing with the new offerings. Asked about the new bike last month, Harley chief executive Matthew Levatich told Reuters that he would not dismiss a competitor’s strengths but that he had faith in Harley Davidson’s brand and would not be changing strategy. Specifications- The Street 750 is the clear winner if you look at the specifications. It offers more power and more torque. However, let’s not jump the gun, for it also weighs more. In on road performance, the difference shouldn’t be as substantial as it is on the paper. Looks- Looks are subjective to personal tastes. The Street 750 is for you if you’re looking for a true-blue American cruiser that can be put to regular use. Even the REs aren’t much different. 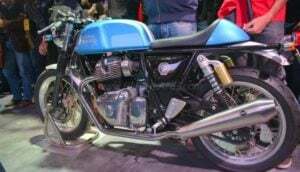 The Conti GT 650 is for you if you are looking for a retro motorcycle that looks racy. The Interceptor 650 will offer you classic charm and basically, best of both the worlds. So, what’s your take on the Royal Enfield 650 vs Harley Davidson Street 750 comparison? Share your views with us by penning them down in the comments section below. Also, stay tuned to Carblogindia for latest news on cars and motorcycles relevant to India.